Her Majesty The Queen made each of the appointments on the advice of the Prime Minister and Lord Chancellor, following the recommendations of an independent selection commission. The commission consulted across each of the Supreme Court's three UK jurisdictions before making its recommendations. "I am delighted that the Supreme Court will be joined by three new Justices in the coming months, each of whom has led a distinguished judicial career. 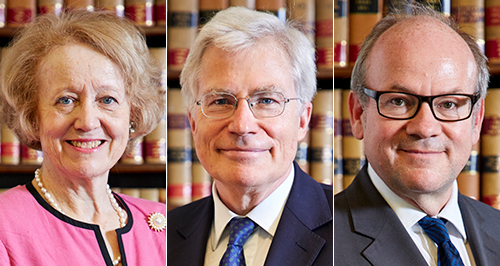 I congratulate Lady Justice Arden DBE, Lord Justice Kitchin and Lord Justice Sales on their appointments and am confident that they will each make a significant contribution to the work of the Court and the development of the law." These appointments follow the retirement of Lord Mance, former Deputy President of the Court, in June 2018. Lord Hughes and Lord Sumption are due to retire in August and December 2018 respectively. Dame Mary Arden read law at Girton College Cambridge and Harvard Law School. She grew up in Liverpool. She was called to the Bar in 1971, became a Queen's Counsel in 1986, and served as Attorney General of the Duchy of Lancaster between 1991 and 1993. She served on the Court of Appeal of England and Wales from 2000 to 2018. From 2005 to 2018 Lady Justice Arden was Judge in Charge, currently Head of International Judicial Relations for England and Wales. She has organised bilateral exchanges between the senior Judiciary of the UK and the judiciaries of leading national and supranational courts overseas. She became a Member of the Permanent Court of Arbitration in The Hague in 2011, and is an ad hoc UK judge of the European Court of Human Rights in Strasbourg. After studying Natural Sciences and Law at Fitzwilliam College, Cambridge, Sir David Kitchin was called to the Bar of England and Wales in 1977. He became a Queen's Counsel in 1994 and was elected a Bencher of Gray's Inn in 2003. His practice covered all aspects of intellectual property including patents, trade marks, copyright, designs and trade secrets. Lord Justice Kitchin was appointed a judge of the High Court, Chancery Division in 2005 and Senior Judge of the Patents Court in 2007. From 2009 to 2011 he was the Chancery Supervising Judge for the Midland, Wales and Western Circuits and, during that time, was also a member of the Enlarged Board of Appeal of the European Patent Office. He was appointed as a Lord Justice of Appeal in 2011 and was the Lord Justice responsible for the supervision of intellectual property appeals. Lord Justice Kitchin is the Chair of the Advisory Council of the Centre for Commercial Law Studies at Queen Mary University of London and has been awarded an honorary LL.D. by that university. He is also an honorary fellow of Fitzwilliam College. Sir Philip Sales was educated at the Royal Grammar School in Guildford, before reading law at both Churchill College, Cambridge, and Worcester College, Oxford. He was called to the Bar of England and Wales at Lincoln's Inn in 1985 and was appointed First Treasury Junior Counsel in 1997. He was an Assistant Recorder from 1999 to 2001, Recorder from 2001 and 2008, and Deputy High Court Judge from 2004 and 2008. Lord Justice Sales became a Queen's Counsel in 2006 and continued to act in the re-named post of First Treasury Counsel Common Law until his appointment to the High Court, Chancery Division in 2008. He was a member of the Competition Appeal Tribunal between 2008 and 2015, and Vice-President of the Investigatory Powers Tribunal between 2014 and 2015. Between 2009 and 2014 he served as Deputy Chair of the Boundary Commission for England. He was appointed as a Lord Justice of Appeal in 2014.